Voyager - the Ultimate Pre-Flight Companion for Your GPS! Your GPS is the perfect device to take into the cockpit to ensure a safe and enjoyable flight. Add the Voyager Flight Software System to it and you have the perfect pre-flight/in-flight combination. With Voyager, it's easy to plan a wind-optimized, fuel-stop optimized flight and, with the click of the mouse, transfer it to your GPS! Normally, a package of the Voyager modules you need for IFR pre-flight planning and a 12 month Voyager IFR ChartData subscription is $497. However, as a ChartData subscriber, it's available to you for just $179. Buy. This special bundle, just for ChartData subscribers, includes Voyager's SmartPlan Premier Preflight Planning Module, the SmartPlates IFR Procedure Management Module and three months of IFR-level ChartData subscription. 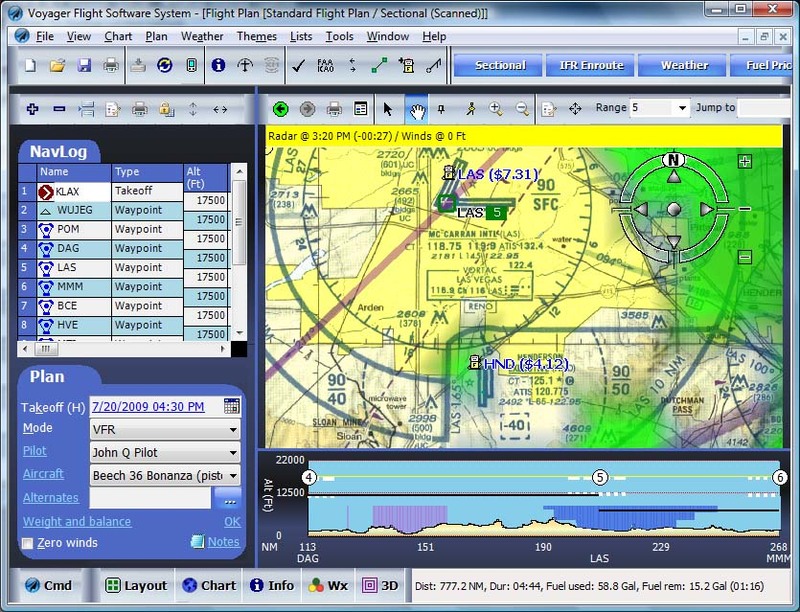 Everything you need for safe and easy flight planning! SmartPlan Premier. Our award-winning SmartPlan Premier flight-planning module includes virtually every feature you can imagine to make it quick and easy to plan your IFR flights. This includes automatic preferred route selection, full use of SIDs and STARs, planning via GPS Direct, Victors or Jets, easy weather checks, electronic flight plan filing, wind and fuel-price optimized routing, flight plan export to popular GPS units, comprehensive printing and much more. SmartPlates. SmartPlates not only puts all 14,500+ approach plates for all 50 states at your fingertips, it also includes easy ways to select, organize, download and print them. 12 Months of IFR ChartData subscription. Our ChartData subscription gives you three months of all application upgrades, new IFR navigational and data every 28 days, approach procedures updated every 28 days, fuel prices updated daily, TFRs updated hourly, access to all scanned charts (Sectionals, IFR Low and High altitude, WACs, and TACs) and complete technical support.